Carl Baker admits he thought he’d done too much to score before rattling home the opener in Dons’ 2-1 win over Sheffield Wednesday on Tuesday night. The Player of the Year scored the opener at stadium:mk after 25 minutes, having cut back and forth to lose his defender before neatly finishing past Owls keeper Keiren Westwood. Nicky Maynard added a second after 50 minutes, but Gary Hooper’s 76th minute goal ensured a tense finale as Dons held on for all three points to climb out of the relegation zone. But after Maynard did well to slide Baker in, the midfielder admitted he felt he may have overdone it in trying to lose his defender. “We’ve not been scoring a lot of goals of late so it was nice to see it hit the back of the net. You could really feel the relief when the lads piled on for the celebration. “That’s huge for us. We’ve been playing well recently, and we were unlucky not to get anything from the game here on Saturday. We’ve been believing and working hard in training, but I’ve not known relief like that down in the dressing room. Having turned provider, Maynard needed no second invitation to sink Dons’ second of the night, racing clear of the offside trap to roll the ball under Westwood to double the lead early in the second half. And there was no way he was missing, according to Baker. He said: “Nicky did really well and shrugged off the defender and did the business. 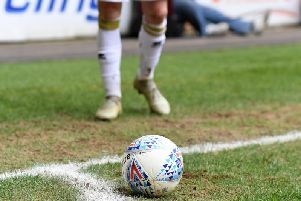 With trips to Nottingham Forest, Birmingham and Leeds, sandwiching a home clash against Cardiff City in forthcoming weeks, picking up three points against a Sheffield Wednesday side on an off night could be vital for Dons as they seek to edge away from trouble over the festive period. While it’ll be a challenge, Baker says the players are excited to be taking on such big names.